Welcome our exclusive range of quality wedding and event hire and design services. Offering over 12 years industry experience, and an extensive range of beautiful event and wedding furniture pieces, a range spanning contemporary, the chic and the classic. Select gorgeous wedding & event hire pieces from our Coastal, Vintage, French Provincial and Contemporary collections. We can recommend stunning colour combinations, wedding decor choices, specialty linens and accessories. We offer professional advice and unique design concepts to expertly style your wedding or event. 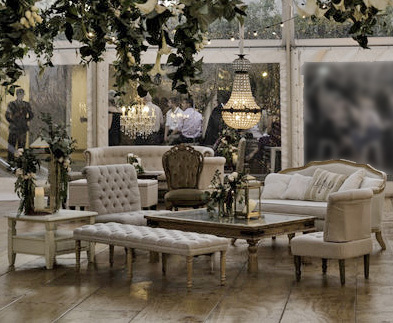 Wedding Furniture hire is now a staple of wedding styling. A fun and very social addition to incorporate in any event whether cocktail, traditional wedding or garden party. 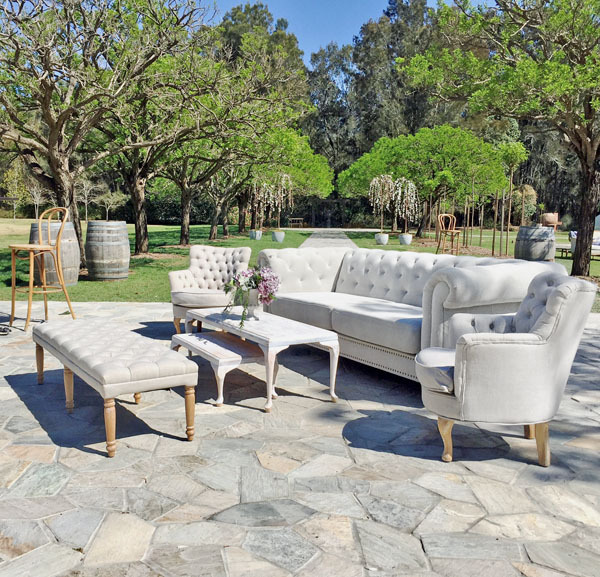 Our lovely pieces provide a lounge “chill-out” zone and our stunning wedding furniture pieces provide the setting for precious photos with family and friends. Everything you need to create a warm, comfortable, lounge area to socialise with your wedding guests. 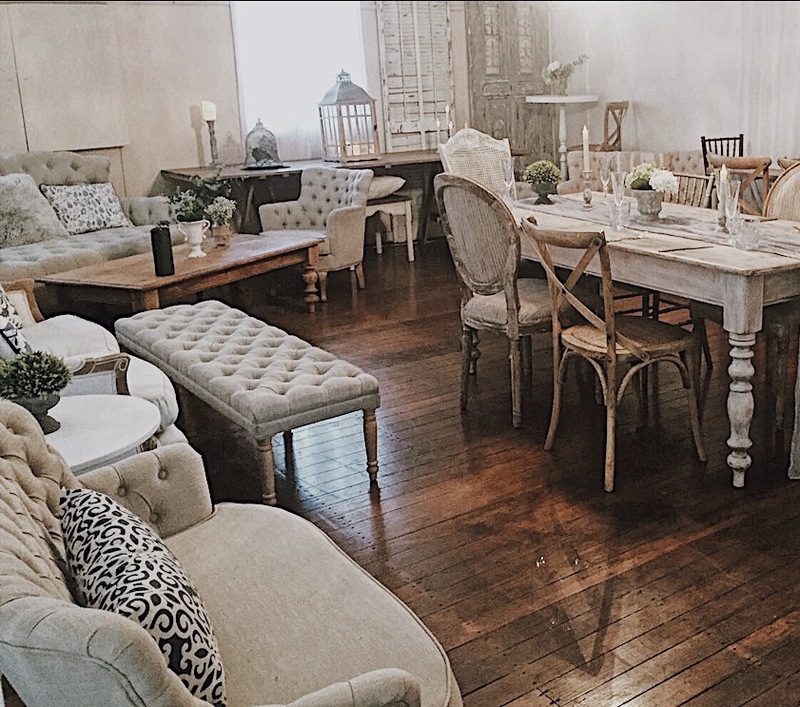 Our beautiful furniture hire range consists of french provincial furniture, rustic timber trestle tables, chiavari/tiffany chairs, timber cross back chairs, french louis chairs, cocktail bar tables, ottomans and bar stools. Just by selecting a gorgeous spindle back tiffany chair for your wedding a room can be transformed and other styling kept simple. These beautiful wedding chairs create a sense of space, elegance and comfort. Our hugely popular timber cross back chairs work superbly for a coastal rustic wedding style or a country rustic wedding, comfortable and a stunning way to create your dream wedding. Our timber trestle tables are generous in space, seating 10 guests comfortably and a beautiful look and feel. The exposed timber of these wedding trestle tables is a refreshing departure from traditional white linen. Some items may also be used for your wedding ceremony, depending on the wedding ceremony location in proximity to your wedding reception. Contact our team to discuss your special event and we can design a custom wedding package for you. Servicing the Hunter Valley, Port Stephens, Central Coast, & Newcastle. We have new stock coming in 2019 - watch this space!